One of the highlights of fall season at the Disneyland Resort is the transformation of the Haunted Mansion into Haunted Mansion Holiday, featuring The Nightmare Before Christmas' Jack Skellington and his ghoulish friends from Halloween Town. Jack Skellington is bringing his creepy version of Christmas to the mansion's 999 ghosts through early January, and it's a sight not to be missed. Haunted Mansion Holiday is now on its 13th year, and it's better than ever, with some new spooky surprises for anyone who dares enter. We were at the Disneyland Resort over the weekend to enjoy Mickey's Halloween Party as well as the Halloween Time seasonal decor and activities. 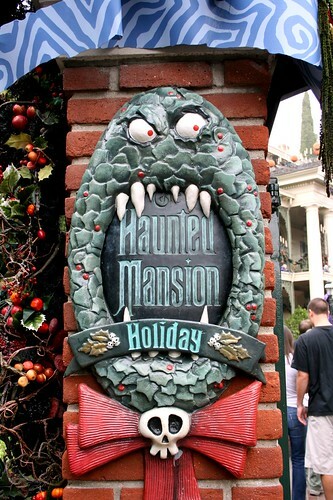 The Haunted Mansion Holiday is one of our favorite attractions: in fact, we all agree that we love Haunted Mansion Holiday even better than the regular Haunted Mansion attraction! We love the festive way the mansion is decorated inside and out, we love the colorful characters we meet inside, we love the upbeat music, we love the yummy smell of the haunted gingerbread house on display in the Great Hall! 1) Haunted Mansion Holiday is not available at Walt Disney World's Magic Kingdom; you can only experience it at Disneyland Park in Anaheim! 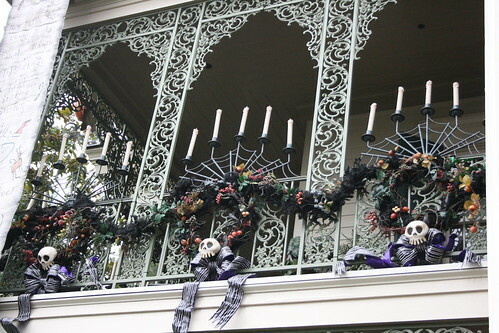 2) Each season, thousands of feet of "Black Gnarly" garland is draped and hung inside and outside Haunted Mansion Holiday. Jack’s faithful dog Zero gathered more than 200 bones to use as décor, garland, and presents. 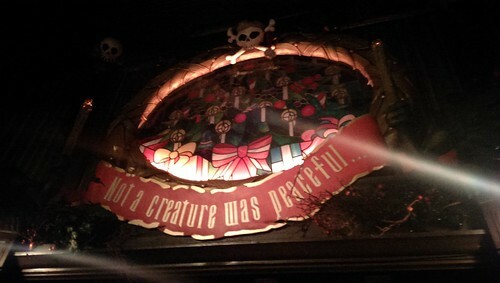 3) The Haunted Mansion is always beautiful at night, but Haunted Mansion Holiday is even more spectacular. More than 400 flickering candles create a ghostly glow on the façade of the Haunted Mansion and more than 100 jack-o-lanterns shine their ghoulish light. 4) The transforming portraits in the portrait gallery have been replaced with Nightmare Before Christmas-themed transforming portraits. New for 2013, Ghost dog Zero makes a surprise appearance, running from portrait to portrait. 5) New for 2013, Jack Skellington and his ghost dog Zero now appear in a fully animated sequence on the ceiling of the “stretching” room, which transports guests into the depths of the Mansion. 6) One of the most popular Haunted Mansion Holiday traditions is the Haunted Mansion Gingerbread House on display at the Grand Hall. This year's mansion resembles a confectionary Advent Calendar. 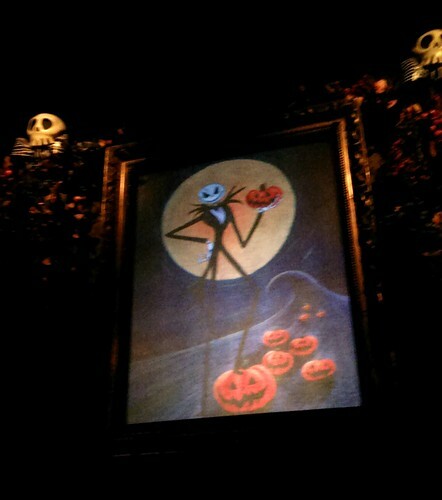 Every week throughout its run, a different door will reveal one of the 13 faces of Jack Skellington. 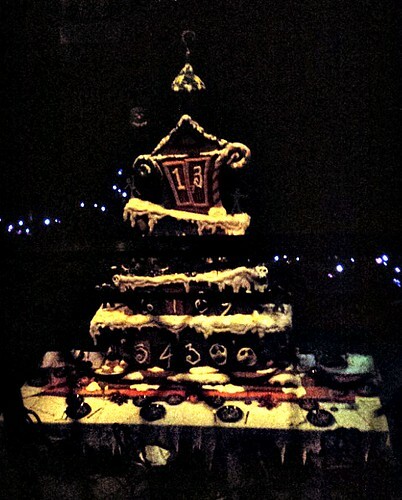 7) A few more facts about the Gingerbread Mansion: it stands more than 13 feet tall and weighs more than 500 pounds. It required nearly 240 pounds of gingerbread, 160 pounds of fondant and 150 pounds of royal icing. A team of five pastry chefs worked for more than a week to complete the Gingerbread Mansion. Three members of this team have been part of the Haunted Mansion Gingerbread House team since it began 13 years ago. 8) Yes, that is gingerbread you smell! As your doom buggy glides past the Great Hall, the delicious scent of gingerbread will make you want to jump out and start eating the gingerbread house (fortunately, there's a snack cart just outside the Haunted Mansion selling seasonal gingerbread men!). 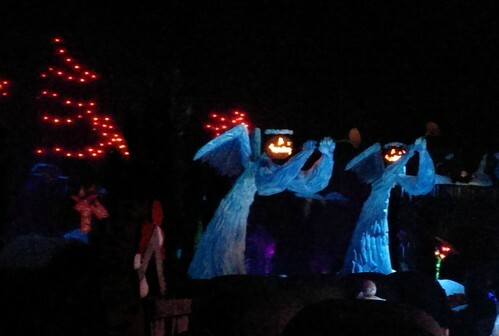 9) The iconic Graveyard Ice Angels are designed with a jagged, look, their ethereal wings and snow-glow colors shining with a more ghoulish luster than ever this year. 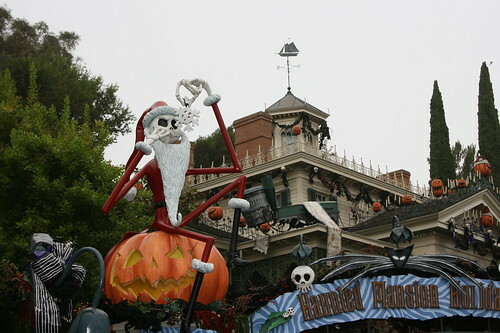 10) The graveyard inside Haunted Mansion Holiday is covered with nearly 7,500 square feet of snow. More than 20 gallons of UV (ultra-violet) paint is used to enhance the snow’s eerie glow. Nearly 1,000 tiny, orange lights decorate the trees. 11) Home Creepy Home – Creepy cobwebs are artistically kept (not swept!) 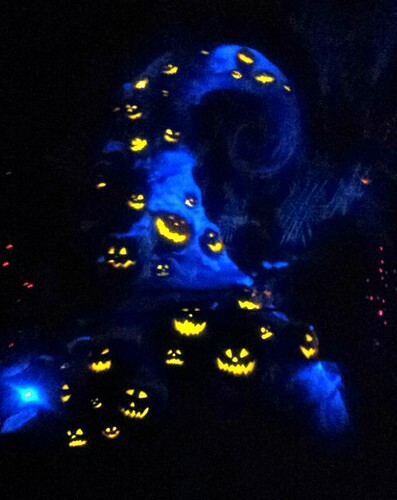 year-round to make Jack Skellington and the 999 Happy Haunts feel right at home. 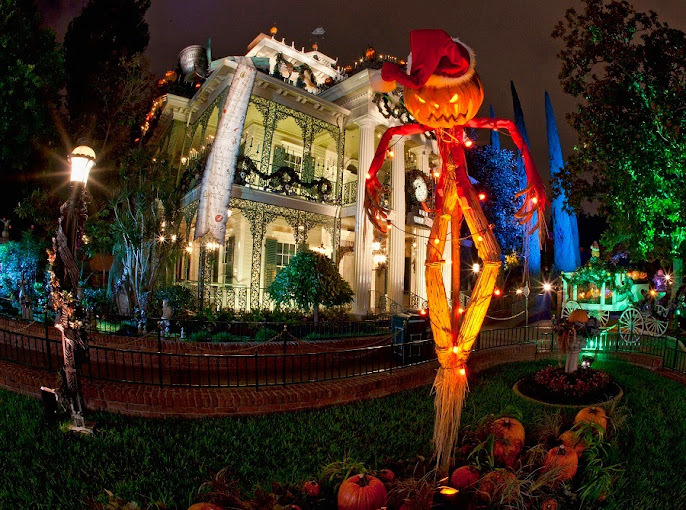 12) More than two dozen additional animated features accompany Jack Skellington to the Haunted Mansion. Look for man-eating wreaths and creepy toys such as vampire teddy bears, a monster train and a jack-o-lantern jack-in-the-box. 13) Disney Imagineer Kim Irvine plays the holiday version of Haunted Mansion psychic Madame Leota, chanting her "13 Days of Christmas" fortunes. Kim is actually the daughter of Leota Toombs, a Disney Imagineer herself, who played the original Haunted Mansion Madame Leota! Disclosure: I attended Mickey's Halloween Party at the invitation of The Disneyland Resort. 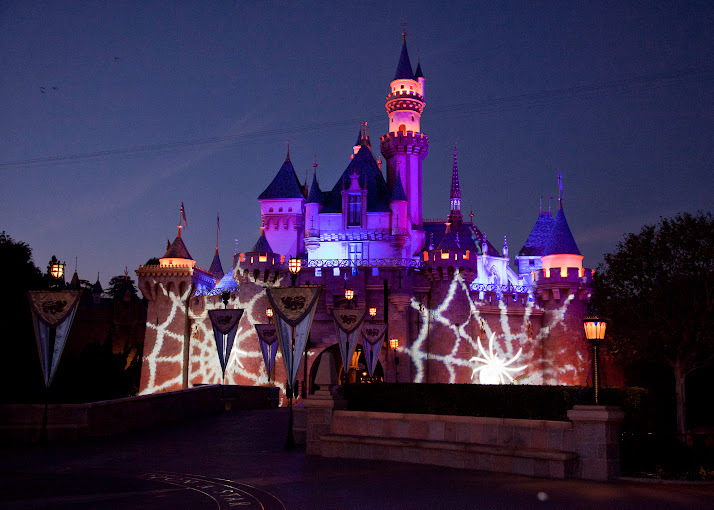 Park tickets, event tickets and accommodation were provided by The Disneyland Resort.. The views and opinions expressed here are my own. Like many families with young kids, we are big fans of Boogie Wipes. The saline in the Boogie Wipes helps clean little noses and dissolve mucus without all the irritation you get when using dry, rough tissues. Boogie Wipes is one of those products that make you think, "Well that was pretty obvious, why didn't someone come up with that sooner?". Well, here's another of those "D-uh" moments -- if they have a great saline wipe for kids, why not have one for grownups? That's just what Puffs was thinking, too! They've teamed up with Boogie Wipes and come up with Puffs Fresh Faces, a moist facial tissue with saline. Hey, grownups get boogies too, and no one likes bright red noses and chapped skin that come with wiping your nose into a dry tissue! With cold and flu season s coming up, it's a great time to stock up on Fresh Faces. But Fresh Faces aren't just for stuffy noses. Puffs sent me Fresh Faces samples to try in three varieties -- lavender, menthol and unscented -- and after using them for a while I think they're also great for wiping sticky fingers, sweaty faces, and makeup! I can use them in place of baby wipes, Boogie Wipes or wet wipes. While the menthol scent is a bit too strong for me (it's infused with Vicks, so people suffering from bad colds might actually prefer it), I love the lavender and unscented versions. They come in two kinds of packaging: a boxed version that looks a bit like a tissue box, and a travel pack you can slip in your purse or car. Super convenient! And as long as you keep the container sealed, the wipes won't dry out. Little Busy Bodies, the makers of your favorite saline nose wipe for kids – Boogie Wipes, has teamed up with Puffs to introduce a new generation of facial tissue. Saline has been used for centuries for both beauty and medicinal purposes, and Puffs® has captured its power in all new Puffs Fresh Faces, the first moist facial tissue designed for everything your face has to face each day. Saline can be used to clean and soothe nasal cavities, dissolve mucus, refresh and moisturize skin, and reduce puffiness. Patented and uniquely formulated with saline, aloe and Vitamin E, Puffs Fresh Faces are designed to help you clean up anything the day can throw at your face. Whether you need to freshen up after a hard workout, remove runny makeup in the heat of the afternoon or soothe your allergy riddled nose, Puffs Fresh Faces in lavender, menthol and unscented get the job done better than a dry tissue. Disclosure: I received a product sample to facilitate my review, but have not been paid to review the product or give my opinions. Product information (in italics) is provided by Puffs. The views and opinions expressed here are my own. One of the most challenging aspects of having to follow a gluten-free diet is the restriction on wheat products. So many of the foods we eat every day are bread-based -- sandwiches, cakes, cookies, pancakes, toast, etc... -- that it might seem overwhelming. I have one word for you: Udi's. They have so many gluten-free products that the only thing you'll be missing is the gluten! Udi's sent me a box of gluten-free goodies to try, and being the Cookie Monster that I am, I immediately went for the sweet stuff. Their Soft & Chewy Dark Chocolate Brownie Bites are to die for. Moist, chewy, chocolatey, I'd treat myself to them any time! Their Maple Pecan Chocolate Chip cookies also taste great, but are a bit too crumbly for my taste. They break apart as soon as you touch them! It's difficult to believe that their hamburger buns and bagels don't have any wheat flour in them. They taste just like the regular whole-wheat version. They are a bit dry and crumbly, but that's easily solved by heating them up in the microwave for 30 seconds. Served warm, they are as soft and tender and chewy as any bread. If you have an intolerance for gluten or want to cut down on your wheat consumption or just want to see what the gluten-free craze is all about, check out Udi's products. I don't think anyone could feel deprived when munching on any of them! Disclosure: This is a sponsored post.. The views and opinions expressed here are my own. 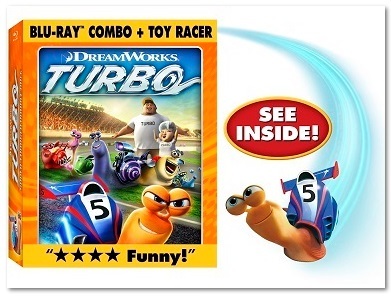 Turbo was one of my family's favorite summer movies. We liked it so much, we watched it twice! If you missed seeing Turbo in theaters, you're in luck: Turbo is coming to Blu-Ray and DVD on October 22. Check it out! * Meet Tito – Director David Soren provides an introduction for a scene that was deleted from the film. * The Race – Director David Soren provides an introduction for a storyboard sequence that eventually made it into the film. Viewers can even see picture-in-picture comparison to the final cut. * Champions Corner - Host Paul Page interviews Turbo one-on-one to hear all about his racing techniques and inspirations! * Be An Artist! – Dave Burgess, Head of Character Animation on the film, shows the audience how to draw: Turbo, Whiplash, Skidmark, Burn, Smooth Move, White Shadow, Chet and Customizable Racers. * Team Turbo: Tricked Out – See Turbo and all the rest of the snail crew in a break- down of the cool components that make up each of their shells. * Be An Artist! – Dave Burgess, Head of Character Animation on the film, shows the audience how to draw: Garden Turbo and Racing Turbo. Disclosure: I did not receive a sample or monetary compensation for this post. Press release (in italics) is provided by 20th Century Fox. The views and opinions expressed here are my own. I can't believe it has been a month since we were in Orlando! We had such a great time cavorting with Minions, drinking butterbeer, and riding attraction after attraction (it literally took Alfie and I days to recover). 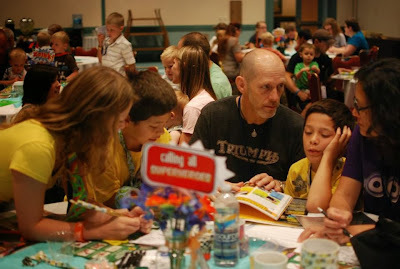 While visiting theme parks is great, you don't need to plan a whizbang vacation to enjoy special family moments. Some of the best times we've had as a family have been sitting at the dinner table, lounging on the sofa for movie night, walking the kids to school, or snuggling in bed with individual kids for a few minutes before kissing them goodnight. The key is being together and sharing a thought, a smile, anything that brings you closer! 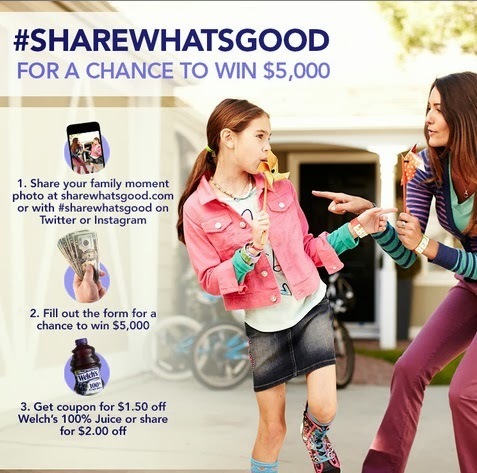 As part of the Share what’s good campaign, Welch’s has launched the “Share Your Moments” photo contest! From 9/16 to 10/25 upload a photo of your favorite family moment for a chance to win $5,000! While there is only one grand prize, everyone who enters will get a $1.50 coupon for Welch’s 100% Grape Juice – or $2.00 if you share the news. Visit Sharewhatsgood.com to enter. For more information about the Share What's Good campaign, and for more information about Welch's, head to the Welch’s Facebook page, or follow @Welchs on Twitter and Instagram. Disclosure: I participated in a campaign on behalf of Mom Central Consulting for Welch's. I received a promotional item as a thank you for participating. The views and opinions expressed here are my own. Get ready for Mickey's Halloween Party at the Disneyland Resort! * Trick-or-treat stations will be set up around the park. Adults and children can trick-or-treat for candy and healthy treats. * New this year is the “Monsters U Dance Party” at Tomorrowland Terrace, a family-friendly "frat" party with Mike, Sulley and the gang from Monsters University. Tickets to Mickey’s Halloween Party purchased in advance are $59 each for selected nights, while tickets purchased on the event days are $67 each. All tickets to Mickey’s Halloween Party on Wednesday, Oct. 30, and Halloween Night, Thursday, Oct. 31, are $74 each. Mickey’s Halloween Party dates are: Friday, Sept. 27; Tuesday, Oct. 1; Friday, Oct. 4; Tuesday, Oct. 8; Friday, Oct. 11; Tuesday, Oct. 15; Friday, Oct. 18; Monday, Oct. 21; Wednesday, Oct. 23; Friday, Oct. 25; Monday, Oct. 28; Wednesday, Oct. 30; and Thursday, Oct. 31. Purchase your tickets early, because only a limited amount are sold, and they do sell out! 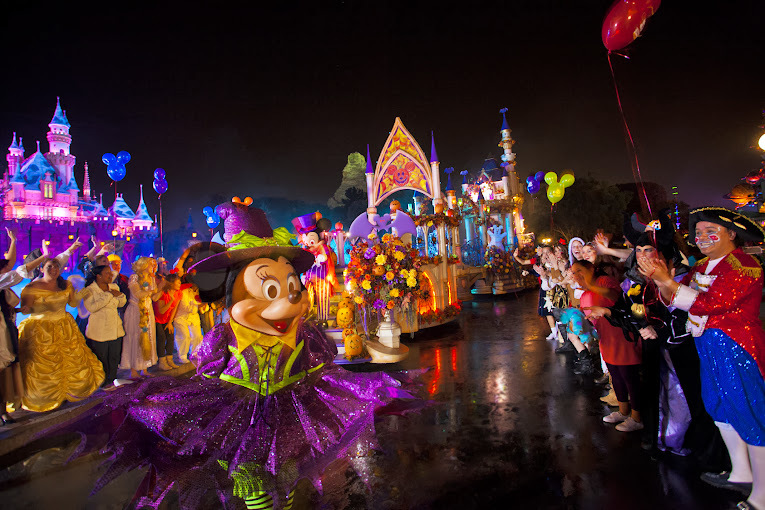 Don't forget to check my Mickey's Halloween Party FAQ post for more details and information! Disclosure:The Disneyland Resort is providing accommodations, event tickets and park tickets so we can experience Mickey's Halloween Party and share our experiences. The views and opinions expressed here are my own. The kids are back at school, and they need lots of tech gadgets to help them with all their homework and projects! Today I'm partnering once again with Cristy from Pretty My Party to host a giveaway for an Apple Macbook Air! This prize has a value of over $1000, and it's open worldwide -- international shipping is included! 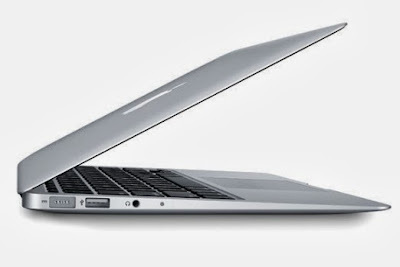 Prize: Apple MacBook Air MD760LL/A 13.3-Inch Laptop is thin, light, and durable enough to take everywhere you go – and powerful enough to do everything once you get there. A fourth-generation Intel Core processor and Intel HD Graphics 5000 deliver high performance, while using less power. So you get remarkable battery life: up to 12 hours on this 13.3-inch model. And with up to 45 percent faster flash storage compared to the previous generation and new 802.11ac Wi-Fi for up to 3x faster wireless, the new MacBook Air is quicker and more responsive than ever. Rules: The giveaway is open worldwide to all participants age 18 and older. If the winner resides outside of the U.S. they are required to pay shipping or opt for PayPal cash in exchange of the prize. The giveaway is open until September 27, 2013 at 11:59 p.m. EST. One winner will be chosen randomly through Rafflecopter. The winner will be notified by email from hello@prettymyparty.com. Please make sure our email is on your safe email list and doesn’t end up in your spam folder. The winner will have 48 hours to respond or a new winner will be chosen. The winner will be announced on Pretty My Party after the giveaway ends. Disclosure: This giveaway is blog-sponsored and is in no way associated with Apple or any of its products, Rafflecopter, Facebook, Twitter, Pinterest, Instagram, Google+, Pay Pal, or any other social media platform. Pretty My Party and those bloggers and businesses participating receive no compensation to promote Apple products, including the Macbook Air. I paid for my participation in this giveaway. The giveaway is run by Pretty My Party, and all questions about the giveaway should be directed to Cristy of Pretty My Party. The views and opinions expressed here are my own. Skype wants you to win a new tv and couch! After decades of daily use, our old couch cushions finally disintegrated to the point where they barely stay up. We decided to turn our guest room into a den, get rid of the old guest bed and move the old sofa into it (it's a sofa sleeper so guests will still be able to spend the night!). We're buying an internet ready tv with built-in apps like YouTube and Skype, so we can watch internet videos easily and Skype with family without having to crowd around a laptop. If you've got an old couch that has seen better days (translation: you're dying to dump it but can't afford a new couch), join Skype's Cool My Couch contest -- just snap a photo of your old couch, and you could win a Skype-ready Smart TV and $1000 towards a new couch! This is Skype's second Cool My Couch contest -- the first one was such a success, they decided to run it again. 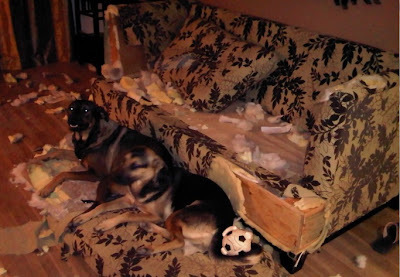 Leave a comment on this post and share your best couch disaster story -- or share the one feature you hate most about your couch. Is it the stains? The lumpy cushions? The ugly pattern? Go on, get it off your chest! This giveaway ends at 11:59PM PST on September 30, 2013; I will draw a winner at random on October 1 and post their name after they confirm acceptance. Continental US residents only. For additional giveaway rules, click here. Disclosure:Skype is providing the giveaway prize for this promotion. No other form of compensation was given.. The views and opinions expressed here are my own. I've just discovered a new kind of snack! No one in my family is on a gluten-free diet, but I would buy Udi's Aged Cheddar Ancient Grain Crisps any time, just because they are so yummy. I don't think they quite nailed the cheddar taste, but they have a savory taste that is absolutely addicting. 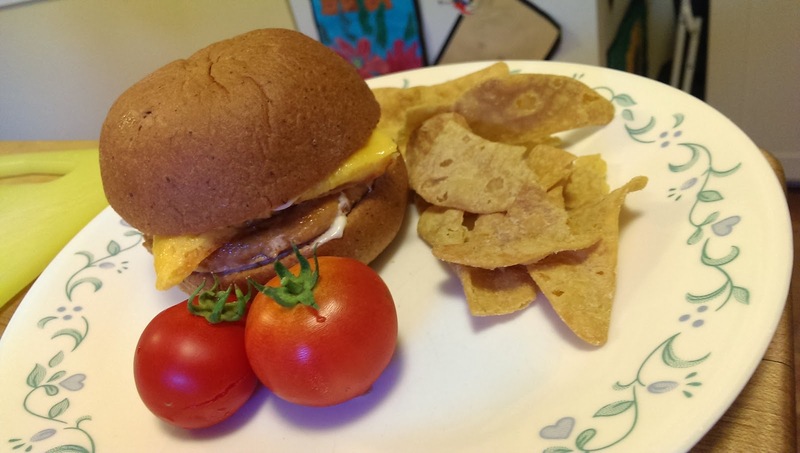 This is the perfect snack if your child has celiac disease or gluten sensitivity -- he won't ever glance longingly at those crackers or breadsticks, ever again! This is just the first of many gluten-free goodies that Udi's has sent us to try, so watch out for more reviews of products where the only thing missing is the gluten, not the taste! 3Po and Jammy help me review new videogame releases several times a year. For the most part, they love the games I ask them to review -- not that they have low standards, but because I already have a good idea of what they like. It's easy to predict that they'll like videogames that feature brands I'm familiar with (Disney, Mario, LEGO, Little Big Planet, Kirby, etc..). But sometimes I go with gut feel and accept reviews for videogames featuring brands that I know nothing about. Sometimes that strategy bombs, and they are simply not interested in the videogame. Other times, it's a huge success, as is the case with our latest review, Rayman Legends. Of course, it turns out that Rayman Legends is a sequel to Rayman Origins, which is one of Ubisoft's most popular titles, not just with kids but with older gamers.... but I didn't know that! I had no idea what Rayman Legends was, but the graphics looked cute and the storyline looked interesting... and I was completely unprepared by how much 3Po and Jammy loved the videogame! The graphics are amazing, the characters are adorable, and it's good, clean fun they can enjoy with their friends. In fact, their friends are all trying to schedule playdates at our house now so they can get a chance to play Rayman Legends on the PS Vita and PS 3. I love it when a gamble pays off, and I get to discover a great new game for the kids! Rayman Legends is available for the Xbox 360® video game entertainment system from Microsoft, PlayStation® 3 computer entertainment system and Wii U™ at the manufacturer’s suggested retail price of $59.99 and for PC and PlayStation® Vita at the manufacturer’s suggested retail price of $39.99. Disclosure: I received a product sample to facilitate my review, but have not been paid to review the product or give my opinions. Product information (in italics) is provided by UbiSoft. The views and opinions expressed here are my own. Last year was the first year that I started letting The Pea bike to and from school by herself. I walk her younger brothers to school, and it would be impossible for me to take her as well, without having to take a car. Much as it killed me to let go, I did -- and I wouldn't have done it if I hadn't been able to give her a cellphone. It gives me such peace of mind to know that she can call or text me to let me know she's okay. Of course, it doesn't always work out that way. The Pea almost NEVER calls me! I always have to call or text her. In a way, I don't blame her. It's kind of tiring to have to call her mother every time she leaves school, just so she can stop biting her nails. So when I heard about the Life360 app, I knew they were on to something. Life360 is a free smartphone locator app that shows you where your family members and friends are on a private map. Instead of asking everyone to give you a call to let you know where they are, they just have to "check in" using their Life360 app. How easy is that? There are two features I really like about the Life360 app. The first is the ability to add "Places" like The Pea's school, her dance studio and our home. The app automatically alerts me when The Pea arrives at any of those defined "Places", so she doesn't even have to check in! You can add up to 2 places with the free app; if you want to add more, you can go with the premium app. The second feature of Life360 that I love is the ability to stay in touch with different groups of people, separately. With Life360, you can create "Circles" and add different people to different circles. I don't need or want to keep track of every single person I know, all the time, so the Circles feature is great. Most of the time, the only people I want to stay in touch with are my kids and my husband. But sometimes it can be useful to stay in touch with other groups of people -- for example, to coordinate convoys for our soccer team. This would have been really useful when our soccer team had a weekend tournament last spring! The tournament was 100 miles away from home, and we all drove in separate cars, and everyone was calling everyone to figure out where the soccer fields were and where the hotel was and had everyone arrived safely. Another great use for Life360 circles would be if I'm running a race with a group of friends and we don't all run together because we run at different paces. Or if a group of friends are meeting at a big stadium for a concert or a sporting event. You really don't need to share your location with these groups every day, but you can turn location sharing on for a particular circle during a particular event. Other people might find it useful to create circles for their children's caregivers, so they can check in when they take Junior to music class or to the playground. Coordination becomes easy-peasy, because not only can you use Life360 to see where everyone in that Circle is, you can also use Life360 to message everyone in that Circle. Disclosure:I am being compensated by Splash Creative Media on behalf of Life360 to write this post. The opinions contained within are mine and mine alone This is a compensated post. . The views and opinions expressed here are my own. Although I love the look and feel of genuine leather, I must say I don't feel the same way about geniune fur. I am perfectly fine wearing faux fur; I think it looks and feels just like the real thing, it's cheaper, and no animals have to die specifically to get it (unlike leather, where cows are being slaughtered for their meat anyway -- sorry to be so graphic!). This is my favorite way to incorporate faux fur into my wardrobe. A motorcycle jacket has rugged appeal, but the faux fur also gives it an edgy kind of elegance. I also love hooded jackets with faux fur lining the hood! A faux fur vest is ideal when it's not too cold out. Can you tell I love the mixed fur-leather look? If you already have a leather or denim jacket, wrap a faux fur scarf around your neck. This faux fur scarf is so pretty, it really highlights the wearer's face! Disclosure: I will be receiving a sample for review from LightInTheBox.com The views and opinions expressed here are my own.